We chose the Chatsworth Summerhouse by Rowlinson Garden Products for Luke and Jackie because it has a real cottage garden feel. It is bright and airy, with fabulous bifold doors and two fixed and two opening windows made of toughened glass. “The Chatsworth” is based on a classic with its hipped roof, has generous roof height and bags of style for outdoor entertaining. With plenty of room for furniture Luke and Jackie can fling open the double-doors and enjoy life to the full. 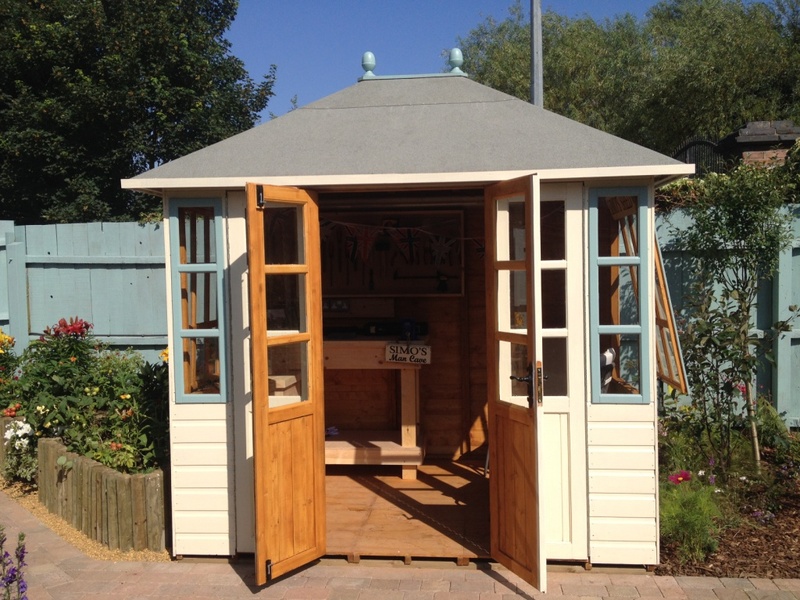 This stylish outdoor building is made from 12mm shiplap cladding, with a 12mm tongue and groove floor and a mineral roofing felt. We turned it into a wonderful workshop for Luke by adding a bespoke workbench, stool and tool cupboard. Ponds aren’t right for everyone’s garden, but it was perfect for this one! 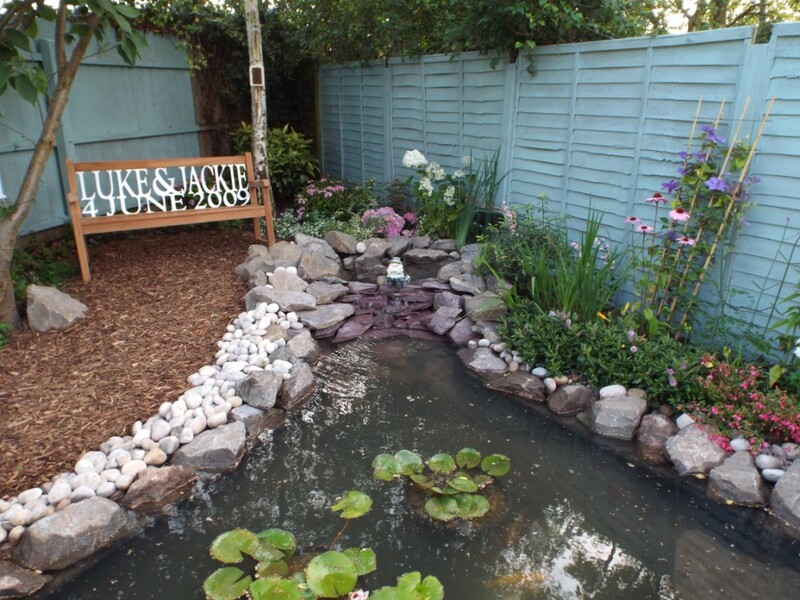 We selected the bespoke pond kit from Maidenhead Aquatics because it contained all of the components that building a pond required – right down to the plants. It comprised of 10’x8’ 0.75 EPDM rubber pond liner, underlay, Laguna Clearflo kit 2500 – which includes a pressureflo 2500 filter and a 2200 maxflo pump. Pond plants include 8x 1L marginal/bog plants, 4x 1L oxygenating plants, 1x 3L water lily. 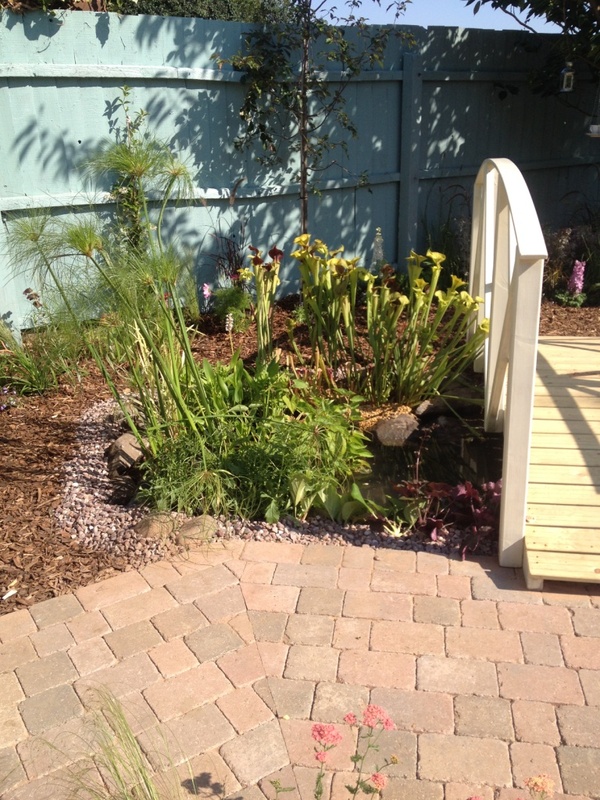 We wanted to build a lovely bridge over the pond and we chose the Koi Bridge by Gardenbridge because it had a gentle gradient, with attractive and decorative handrails. 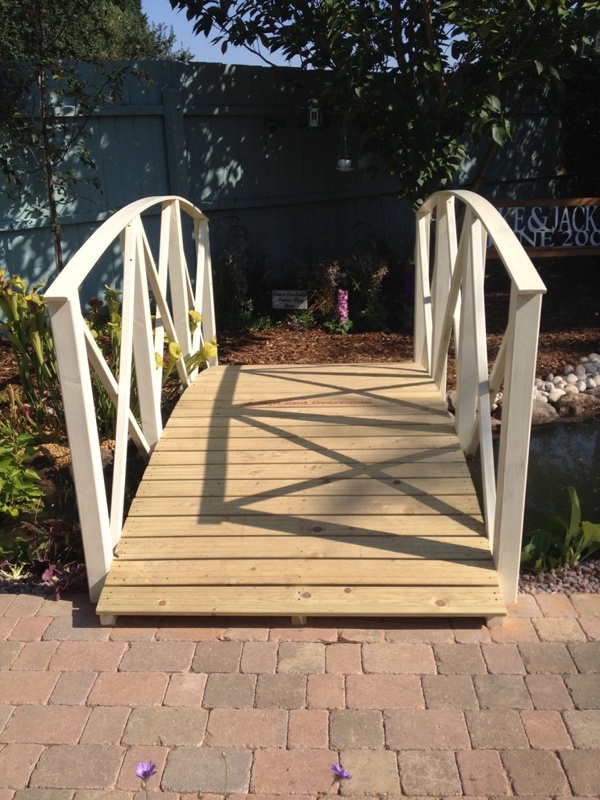 The bridge measures 2.1m x 1.2 metres it comes in a natural wood colour (which is treated) , however we painted it in Protek Woodstain’s Royal Exterior cornish cream to match the summerhouse, shed and kennel. The wooden garden bridge came in kit form and was very straightforward to put together. It comes in a range of sizes from 1m – 3.6m long and 60-120cm wide. There is an option to have anti slip boards plus solar LED lights in it. We wanted to give Luke and Jackie’s garden a really country cottage feel and the Woburn Rumbled Rustic Pavers by Bradstone were perfect. This delightful cobble-type paving features a rumbled finish with smooth rounded edges and a softer surface for a weathered appearance and a slightly mottled effect. The natural stone pavers come in 4 different sizes and we used 3 to give a really natural and random effect. We selected the Rustic colour, however they are available in Autumn, Brindle, Fossil Buff, Graphite and Autumn Block – something to suit any garden. Because they are pavers, they can also be used for drives and a feature circle kit is also available. 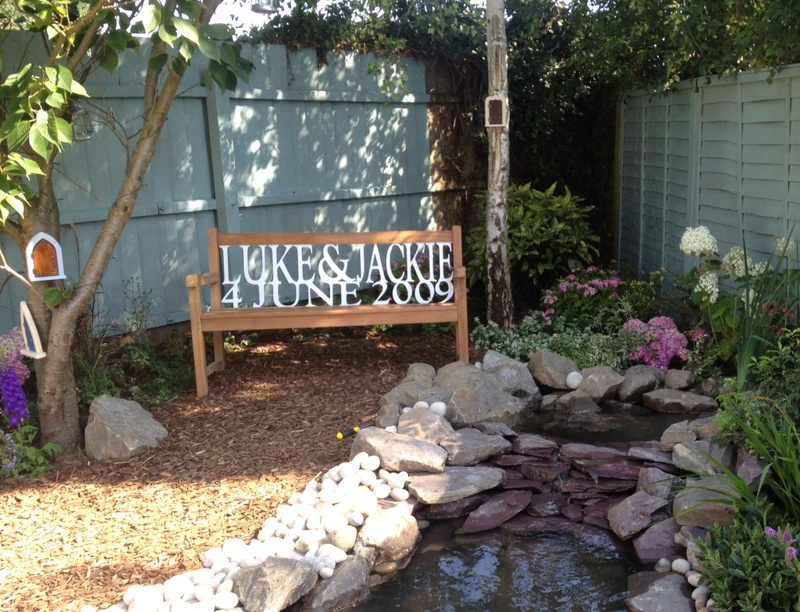 We wanted to get something really personal in the garden for Luke and Jackie…and what better way than with a personalised bench by Freteak? This bench is beautifully crafted from teak and Luke and Jackie’s names are inscripted in the back of it. 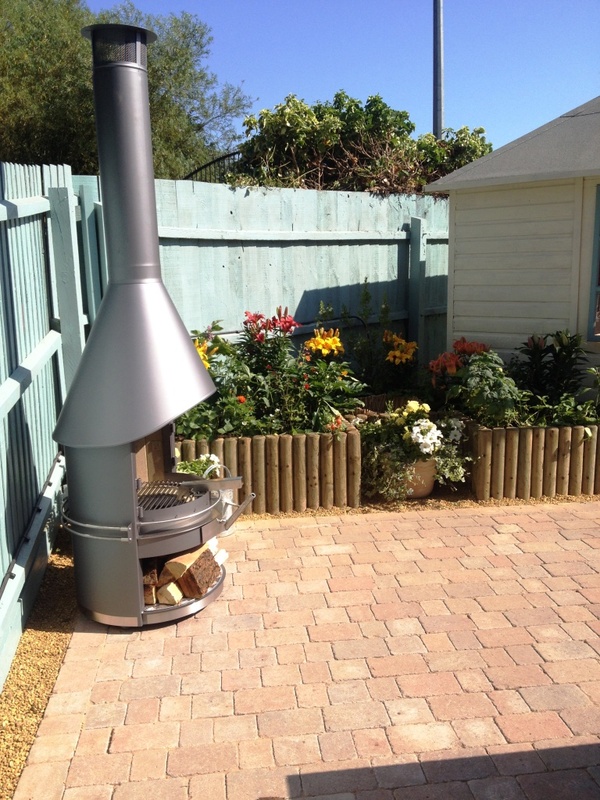 Luke and Jackie love entertaining and being outdoors, so the Girse Outdoor Fireplace and BBQ from Robeys is the perfect combination. The vermiculite stone in the fire chamber reflects back the heat, creating a fantastic outdoor fireplace. It is available in the following colours: Metallic Grey, Brown, Black.